An unqualified person who makes such a claim exposes himself/herself to many dangers. It is an extremely bold statement for a person to claim that a Hadith on a particular subject does not exist. For a person to substantiate such a claim, he/she must be able to verify that such a narration is not found in any of the 100,000 + Hadiths and thousands of volumes of Hadith literature. There are very few expert scholars in the world today who can conclusively state that a Hadith does not exist based on their extensive knowledge of almost every single Hadith in existence. There are specialists in every field, and the greatest specialists in the field of Hadith scholarship are the numerous scholars of the past who devoted their lives to the study of Hadith and memorized thousands of Hadith. Detailed biographies have been written on the lives of these great scholars, which include Imam Bukhari, Imam Tirmidhi, Hafidh Ibn Hajar, Hafidh Sakhawi, Imam Hakim, Hafidh Iraqi, Hafidh Dhahaby, Hafidh Zabidi, Hafidh Haythami, and others. Their knowledge of Hadith and their insight in this field is unparalleled in history. One can accurately describe many of these scholars as ‘walking computers’ in an era in which computers did not even exist. Ibn Rajab Hanbali, the student of Imam Ibn Taymiyyah, has written a book on the virtue of the knowledge of the scholars of the past over that of later generations. They meticulously examined the chains of narrators of Hadith, after studying the lives of thousands of narrators of Hadith, in order to determine the level of authenticity of these narrations. The expert opinions of these great Hadith scholars of the past are the highest authority in determining the authenticity of a Hadith. Some people have claimed that no Hadith exists which states that the Du’as of a Haji for others are accepted, and have written an article to this effect. (http://www.farhathashmi.com/articles-section/belief-and-introspection/in-the-hajj-zone/) The author has not provided any substantiation for her claim and has not quoted any authorities in the field of Hadith to corroborate her claim. 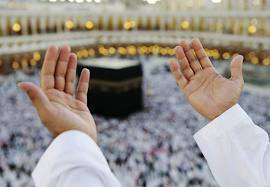 The claim made in this article is incorrect and in fact there are numerous narrations attributed to Rasulullah sallallahu `alayhi wa sallam in which he said that Allah forgives the sins of the Haji (a person who performs Hajj) and the person for whom the Haji prays to Allah to forgive. I have compiled a detailed analysis of the authenticity of these narrations and the entire discussion on this subject in Arabic below [please scroll to the end of this article]. For the benefit of the readers who do not understand Arabic, I will summarize the main points below. These narrations do not mention the acceptance of all the invocations (Du’as) of the Haji, but specifically mention the prayers of the Haji in which he/she asks Allah to forgive others. Another version of this narration is in the form of an invocation of the Holy Prophet sallallahu `alayhi wa sallam asking Allah to forgive the sins of the Haji and the person for whom the Haji asks Allah to forgive. This narration has been quoted in numerous primary Hadith collections including Mustadrak Al-Hakim, Musnad Bazzar,Sahih Ibn Khuzaymah, Mu’jam As-Saghir of Tabarani, Musnad Musaddad, Musannaf Ibn Abi Shaybah, and numerous other books. Many secondary Hadith sources also quote this Hadith including Ithaaf As-Saadat Al-Muttaqin, At-Targhib Wa At-Tarhib, Lataaif Al-Maarif of Ibn Rajab, Majma’ Az-Zawaaid,Mukhtasar Zawaaid Al-Bazzaar, Khash Al-Khifa, Ithaaf Al-Khayarah Al-Maharah, Nasb Ar-Rayah,Mishkaat Al-Masabih, Kitab Al-Adhkaar, and others. Imam Hakim has stated that the chain of narrators of this narration is authentic in conformity with the requirements of Sahih Al-Muslim, and Imam Dhahabi confirms this. Hafidh Haythami, Hafidh Ibn Hajar, and others have authenticated this narration. There is also another version of this narration narrated inMusnad Ahmad which is slightly weak. Hafidh Haythami writes that one of the narrators of this Hadith is weak, whereas Imam Zabidi has classified this narration as ‘Jayyid’ or reliable. In summary, many great scholars of Hadith have examined the chains of narrators of the subject matter of this Hadith – which mentions the Du’as of a Haji on behalf of others – and have accepted its authenticity. Hafidh Sakhawi was asked if there was a specific period of time in which the sins of the Haji are forgiven and his prayers seeking forgiveness for others are answered. He dictated a detailed response to this question in his book, Al-Ajwibat Al-Mardhiyyah. He explains in light of the above-mentioned narrations that no specific period is fixed for the acceptance of the Du’as of the Haji on behalf of others and this is the established opinion. The evidence presented above should be sufficient to prove that the Du’as of the Haji on behalf of others are accepted. The only difference of opinion is regarding the time period of these Du’as being accepted. We will discuss this difference of opinion below. Hafidh Sakhawi also acknowledges that there are some narrations reported from the Sahabah and Tabi’een specifying a time period for the Du’as of the Haji on behalf of others. There is no Hadith attributed directly to Rasulullah sallallahu `alayhi wa sallam in this regard, but there is a chain of narrators recorded in Musannaf Ibn Abi Shaybah which quotes Umar radiyallahu `anhu as saying that the Haji will be forgiven and his Du’as seeking forgiveness for others will be accepted for a total of 90 days, i.e. 20 remaining days of Dhul Hijjah, the entire month of Muharram, the entire month of Safar, and the first 10 days of Rabi’ Al-Awwal. Hafidh Busayri explains that a weak narrator is found in this chain, and Hafidh Ajlawni adds that a narrator may be omitted from this chain. Hafidh Ajlawni also quotes another similar narration stipulating 100 days as narrated by Yasin Az-Zayyat which also contains a weak narrator in its chain. Hafidh Sakhawi writes that these two weak narrations do lend support to one another. It can be inferred that the statement of Umar radiyallahu `anhu was indirectly gained from the Holy Prophet sallallahu `alayhi wa sallam because the subject matter of this narration cannot purely be deduced using one’s intellect, as is explained in books of Usul al-Hadith. If we accept the authenticity of this report, then the time period for the acceptance of the Du’as of the Haji seeking forgiveness for others is 90 days and not 40 days as is commonly believed and quoted by the article in question. Hafidh Sakhawi acknowledges this view of 90-100 days, but gives preference to the view that there is no time limit or restriction for the acceptance of Du’as of the Haji for others. Perhaps, this is based on the higher level of authenticity of the general reports which do not fix a time period as opposed to the weaker narrations stipulating 90-100 days.